my boyfriend and i share the same closet. of course, my stuff occupies most of it and still i cannot help borrowing some of his stuff sometimes. 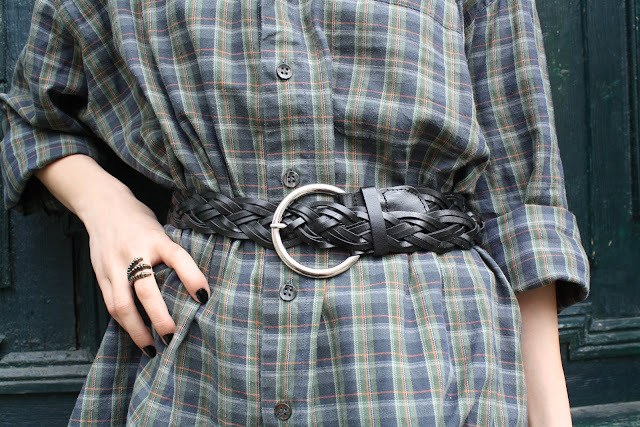 my favorite is this green plaid shirt that i wear as a shirt dress. we definitely don't share the same size but i can still make it work. i just roll up the sleeves and use a belt to make it more form fitting. this time i wore it over skinny jeans and with my olive oxfords. you can check out the way i styled the same shirt last winter here. i've been know to wear my guy's sweatshirts also, you can check out the outfits i assembled here and here. what can i say, i love taking a break from my own wardrobe and delve into his. and i very much enjoy putting on this kind of very relaxed and casual outfits. do you guys borrow stuff from your guy's closet? iti sta foarte bine cu camasi masculine. Esti slabuta si inalta si nu te disproportioneaza! Very cute and comfy looking! I adore the colour. And YES, I do steal from my husband! He's a 8 inches taller than me, but slender, so it actually works out well. I almost wish there was more of a height difference so that I could wear his shirts as shirtdresses...actually, if I were shorter I could wear shirtdresses period...usually I can't! Oh, and your hair is thrilling as usual! Wow, love the way you wear your bf's plaid shirt. I also love the purple skinny jeans, they really compliment your awesome figure. P.S. Have I told you how much I like your haircut? It rocks. @anonymous: you are absolutely right, but i am so lazy with makeup. i dye my eyebrows in the same orange shade as my hair but now the color has faded and my eyebrow pencil doesn't doo such a great job. i'll do my best to wear more makeup in the future.